Following vector maps on the web (cloud futures #1), here is a freemium online validation service (OVS) that helps us QC, quantify and clean up spatial data on the web. 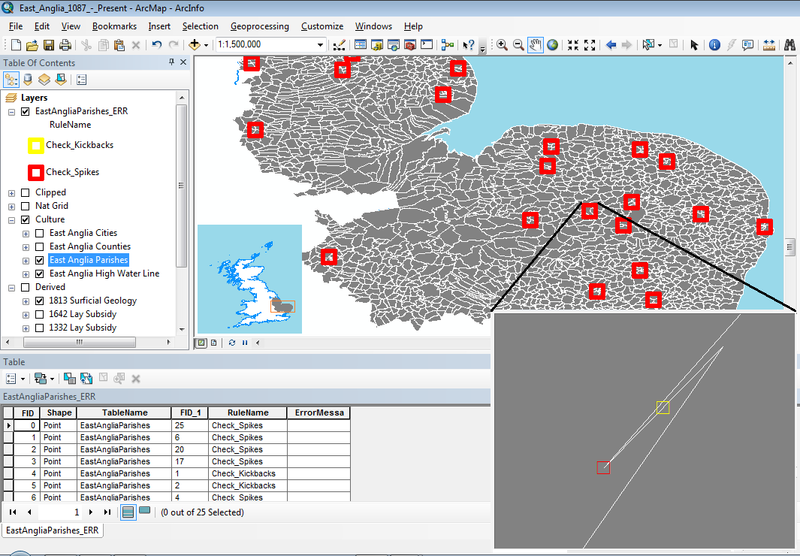 A speciality of 1Spatial is its spatial validation, an essential first step to setting up proper spatial data infrastructure. They spun off 1SpatialCloud to offer the same service online. how good are vector data in East Anglia, as part of data.guv.uk data feedback? how well did I transpose attributes from Darby's map plates into shape files? OVS offers a set of rules on shape files I report this week and attribute tables next. Provided shape files are under 5 Mb, it's as simple as 1-2-3: 1) upload, 2) select the rules to test vector data integrity, and 3a) view the report for free on line, or 3b) download it for one credit to get another shape file with "data busts" as points with descriptive attributes. Stay tuned for further tests on attribute data. I wish to thank Socium for helping me get on this service as it started. Awesome blog indeed ! I hope I'll be a good web developer soon. Did you know that Web Services does Magnificent web services? Anyways thanks for sharing!